For those who choose to visit Venice, it is a city that offers many opportunities to decipher its ways. Every angle, every palace, church, alley, or campiello holds history (some more than just one story) The fascinating city on water seems to never grow tired. Nonetheless “recent” history, one that is nothing near romantic –but quite the opposite- is still very important to remember and is hidden within this city. It is the case of the “stumbling stone” in Venice. The project “Pietre d’inciampo” (from the German word “Stolpersteine”) is an initiative by the German Artist Gunter Demnig in memory of the citizens deported in the Nazi concentration camps. 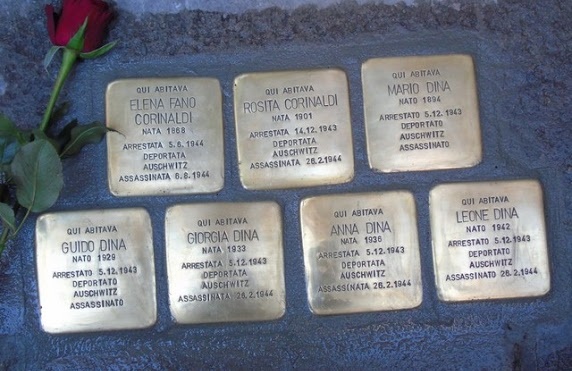 The initiative started in 1995 in Colonia where Gunter had the idea of installing on cobbled stones a 10×10 cm brass plaque in front of the victim’s homes. When walking along the streets of Venice, pay attention to the masegni or cobblestones on the ground you might notice these momentous brass plaques collocated in the Cannaregio Quarter (they aren’t just found in the Jewish Ghetto but in Castello, San Marco, Dorsoduro, Lido di Venezia, and the Island of San Servolo.) To know exactly where the plaques are positioned, consult the interactive map.